Australian scientists say they're examining a low-frequency underwater acoustic signal that could have resulted from Malaysian Airlines Flight MH370 crashing into the Indian Ocean. The signal was picked up by underwater sound recorders near Rottnest Island just after 1:30 AM (UTC) on March 8th, which is consistent with the mysterious disappearance of the plane. 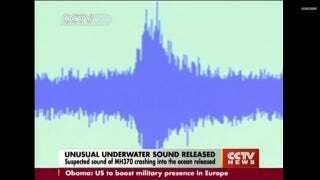 Alec Duncan from Curtin University's Centre for Marine Science and Technology in Perth believes the low frequency signal could have been MH370 either hitting the water or a part of the aircraft imploding as it sunk to the bottom of the ocean. Alternately, and far more likely, he says the sound could have originated from a natural event, such as a small earth tremor. A possible estimate for where MH370 might have crashed in the Indian Ocean (Curtain University via SMH). Duncan believes there's a slim chance — about 10% — that it's the sound of the plane hitting the water, though he admits it's difficult to assign probability to such a thing. "Data from one of the [Rottnest] recorders showed a clear acoustic signal at a time that was reasonably consistent with other information relating to the disappearance of MH370," Dr Duncan said. "The crash of a large aircraft in the ocean would be a high energy event and expected to generate intense underwater sounds." "We sent the data to search authorities and I got a phone call at 3am in the morning so they were definitely interested in it." Dr Duncan said the timing of the signal (consistent with the disappearance of the aircraft), the fact that it was a long-distance event and the north-west direction of the frequency were the three factors that gave researchers hope the noise may have been caused by MH370. "It has since been matched with a signal picked up by CTBTO's station south-west of Cape Leeuwin," Dr Duncan said. "A very careful re-check of data from that station showed a signal, almost buried in the background noise but consistent with what was recorded on the IMOS recorder off Rottnest. Unfortunately, incompatibilities exist between the proposed location of the sound and the satellite "handshake" data transmitted from the aircraft, which is still considered the most reliable source of information. So this evidence is circumstantial at best, but in the words of Duncan, still quite "tantalizing." His team will continue to analyze the data. The plane was carrying 227 passengers and 12 Malaysian crewmembers when it disappeared on March 8th, 2014. Read Ducey's entire report at SMH, which includes a video and a sample of the acoustic signal.